Explore beautiful Grand Central in the Christmas season. Now 105 years old with a rich history, it is better than ever, and even more popular with visitors both for its architecture and the stories behind the scenes. The tour will include explaining the architectural style inside and out, and understanding the colossal growth of railroading as America’s first major industry, followed by later collapse and near destruction of GCT. Then came the dramatic rescue via a Supreme Court decision, leading to renovation and rejuvenation and now popularity. You will also get the inside story of the tennis courts, the Campbell Apartment, and The Twentieth Century Limited, plus what is coming next – called East Side Access. The tour starts at 10:45 AM at Track 29 of the Main Concourse. Come early to get your audio headset that makes listening easy. The tour will last about one hour and fifteen minutes – or until approximately 12 Noon. At the conclusion of the tour, there will be an optional group lunch at The Oyster Bar, a la carte. If you would like to attend, please RSVP to Bill Rosser at bill.rosser77@gmail.com. The limit for this tour is 30 people. Please email programming@hbscny.org if you wish to join the wait list. VP, Distinguished Analyst at Gartner Inc. Your tour guide will be Bill Rosser, HBS MBA 1962. 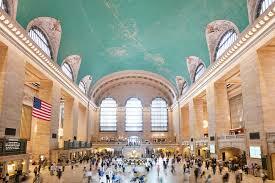 He has been active as a regular volunteer docent at GCT for five years with the Municipal Art Society. He is also active with the HBSCNY Senior Program Committee as co-chairman, plus its regular brown-bag lunch, and its Book Group. Other retirement activities after a career in information technology are the New York Academy of Sciences, the New York Architecture League, and DoCoMoMo.